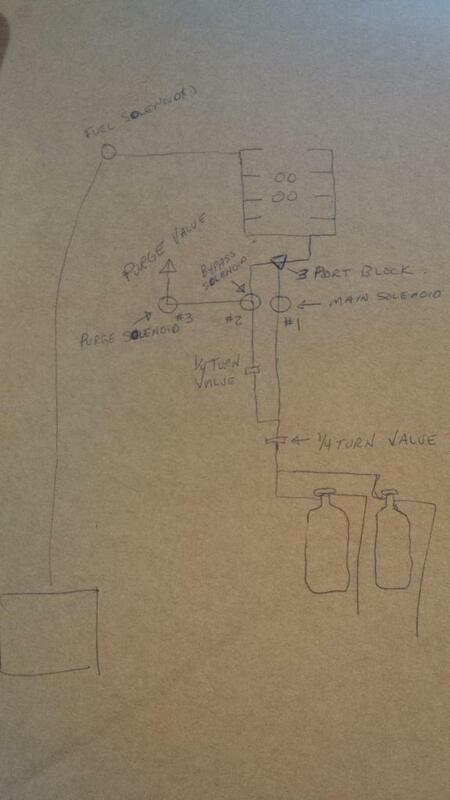 just put a 1/4 turn man valve where its easy to get to in a hurry, no need for additional solenoids etc. richter69 wrote: just put a 1/4 turn man valve where its easy to get to in a hurry, no need for additional solenoids etc. I get that is the way it is done, usually the way I do it too, but I like the second solenoid redundancy idea, as the chances of having 2-solenoids fail simultaneously is like winning the power ball, but if 1-fails you don`t even know it failed until you test it ...the round is not lost and the solenoid / lines and wiring might be a 1/4-1/2 lb of added weight with a full round of insurance...both valves are open when it counts...both easily accessible. Just use a quality noid w a screened fitting.... The extra noid is just adding more issues imo. richter69 wrote: Just use a quality noid w a screened fitting.... The extra noid is just adding more issues imo. Makes sense... I am guessing that you use a better quality noid than the typical purge kits come with, that is the weak link in my mind. The wheel works I will leave it alone.